Once in place, the AccuFrame® Energy Seal gasket is extremely effective. The lineal gaps between wall plates and other framing and sheathing components are small, but stretch around the entire house, often reaching 300 lineal feet in a medium-sized house. Taken in total, the air infiltration through these gaps is significant and must be addressed to meet the new energy requirements necessary to receive a Certificate of Occupancy needed for sale of many new homes. “If you drill it, you fill it” is the new mantra now heard on site that sums up the importance of minimizing air leakage holes and gaps while construction is ongoing. Some builders are attempting to achieve the new standards using labor-intense methods such as caulking interior framing gaps, and/or taping and rolling exterior sheathing seams with specialty tapes. Taping of sheathing seams and water resistive barriers certainly helps to mitigate air intrusion, but it also shifts the air intrusion location to other unsealed areas. In buildings that are not sealed completely, air flow within the wall will result from the stack effect. The stack effect results from differences in temperature and moisture content of the inside and outside air. Warm air is more buoyant than cold air and will rise above the cooler air. In a house wall, a column of air is present and air buoyancy will result in air flow if the wall cavity isn't properly sealed. Let’s look at the house as a ‘whole-system’ during a wind load event. Wind load against the foundation top (50 Pa = 20 MPH wind load) forces air currents upward and is caught where the siding overhang is lower than the sheathing creating a small soffit-like trap, or worst yet, a U-channel (see figure) exactly where the lineal sheathing to frame gaps are located. To compound the problem further, planned superior air flow, above the wall leakage point at the top plate, drafts air upward from soffit to ridge vent. This air flow results in a dynamic flow of air up through the wall cavity that is driven from below by wind load. 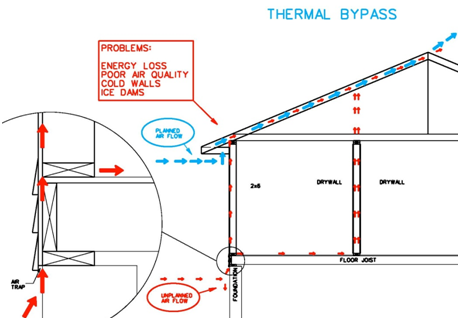 The combination of air being pushed in from the bottom gaps and lifted from the top exit point not only diminishes insulation values, it also plays a role in ice-damning at the roof edge because it occurs directly below the loss of semi-conditioned air and vapor passing through the wall cavity. This heat loss can be a contributing factor to ice damage and can occur 24/7, not only during the freeze/thaw cycle that occurs daylight hours. Keep in mind that the framing gaps can run nearly the entire length and width of a house, at both top and bottom plates, regardless of nail pattern. The video below demonstrates how virtually every wall built in America today functions at a 50 Pa pressure differential. Undeniably, unsealed sheathing to frame gaps (which, as mentioned above, can account for 50% of air leakage), when taken together, greatly contribute to the stack effect and energy loss in all climate conditions and offer a likely target for mitigation of the problem. 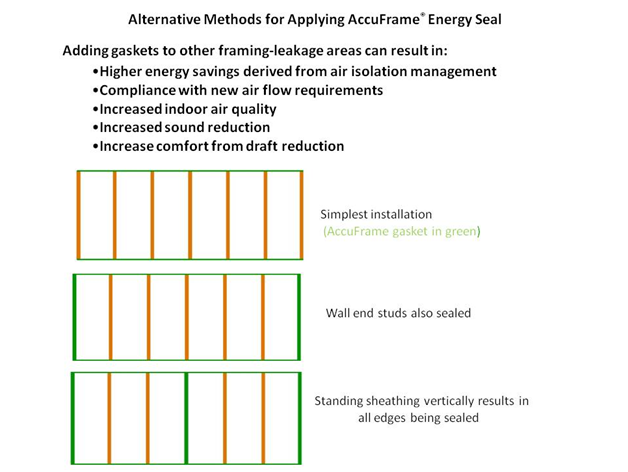 The AccuFrame® Energy Seal method is designed to fill this 'gap' and is an economical effective solution to eliminating unwanted air infiltration. The AccuFrame® Energy Seal innovation is offered by the first company solely driven towards 'On-Site Manufacturing' of homes with a repeatable building model that reduces common framing errors and speeds up the layout process. Approximately 85% of home building activity in the US occurs on-site where it’s the most flexible and cost effective to manage. In addition to its inherent air flow reduction and subsequent energy savings, AccuFrame® Energy Seal reduces framing errors for the entire assembly team by detailing two stud location lines, with a center mark X, that has tangible results in both quality control and quality assurance, when labor turn-over is an issue. The flexibility of AccuFrame® Energy Seal in on-site manufacturing allows for utilization of different application layouts to meet different building needs. The figure below illustrates some possible alternatives. Next generation AccuFrame® Energy Seal product will be integrated with a CAD 3D model that will provide a printed gasket with all framing data listed on the gasket. This method has been tested in a time/motion study that saved 20% in framing labor under tightly controlled parameters. The AccuFrame® Energy Seal template/gasket combination approach is unique, practical in application, and has been granted national and international patents.